" မီးၾကားမကပ္မိေလႏွင့္ ဟပ္မိလွ်င္ အခြာရ ခက္သည္ "
Updates on Ayinepan network . . .
01/02/2007 Thanyawzin.com has been updated as a myanmar friends networking site, like friendster and myspace, dedicated purely for Myanmar Burmese People. Register and save your favorite names quickly before someone else take them. 08/20/2006 : Our Forum Section in Ayinepan has been deleted due to excess spam postings of drugs and adult rated contents. Currently we are still looking for a new open source forum software that handles spam nicely. 08/03/2006 : Launched our latest music video site MyitZuRi.com. This site has all the latest music MTVs from Myanmar. The website is in Myanmar Language. If you are not using IE brower, you need to have Zawgyi-One font installed. You can also send ECards from the site with your favorite MTVs. 07/28/2006 : မ်ိဳးၾကီး ၊ အငဲ ၊ ေလးျဖဴ ၊ ငယ္ငယ္ ႏွင္႔ အာဇာနည္ သီခ်င္းမ်ား အပါအ၀င္ Monthly Ayinepan MP3 Selections were updated in Ayinepan Music Section. 07/19/2006 : We added a new section, Travel, on Ayinepan. Currently it's still under development. This is for easy access to Torist information for travelling to Myanmar. 05/28/2006 : ဒီေလး ၊ မ်ိဳးၾကီး ၊ အငဲ ၊ ေဇာ္၀င္းထြဋ္ ႏွင္႔ ဂ်ီလတ္ တို႔၏ သီခ်င္းမ်ား ကို Ayinepan Music Section မွာ တင္ခဲ့ပါသည္။. 04/04/2006 : Launched our Myanmar Blog Site AinMat.com. This is for everyone who loves to write and read Myanmar. Visitors can register, write, make comments. 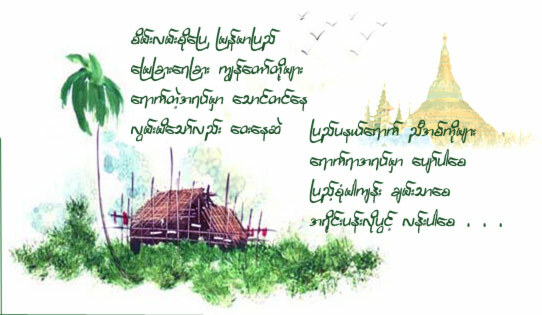 It currently has poems, stories and jokes in Myanmar. If you are not using IE brower, you need to have Zawgyi-One font installed.